It’s always a special day when you get to cuddle your baby niece or nephew for the first time, but for Daniel Throop this experience was even more meaningful. 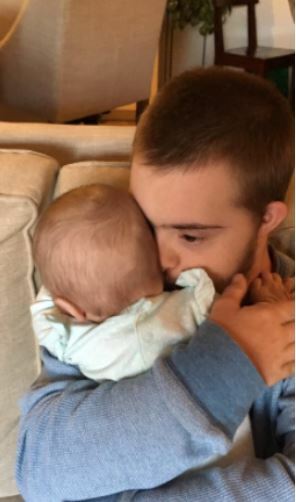 20-year-old Daniel has Down’s Syndrome and is sadly, often refused permission to cuddle babies because of this, despite the fact his condition doesn’t affect his ability to hold them. Daniel loves babies, but rarely gets the opportunity to interact with one. Unfortunately, people often don’t see beyond his condition long enough to acknowledge the affectionate and loving person he is. 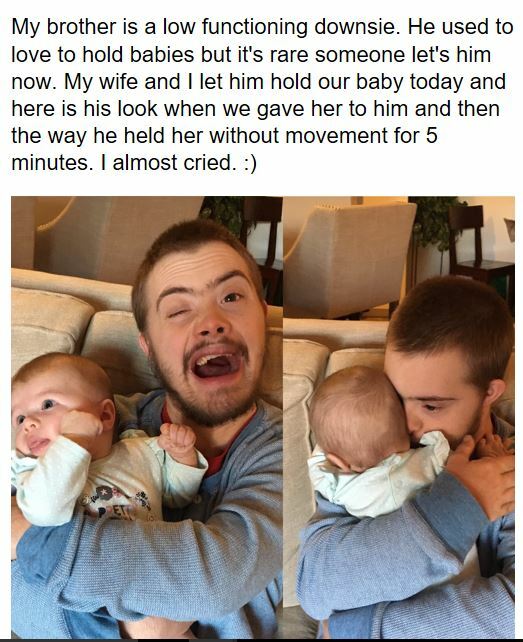 Daniel’s big brother Kevin has now uploaded pictures to Reddit, showing Daniel holding Kevin’s three-months-old baby Maysen Ava, hoping to break down the stigma against those with Down’s Syndrome holding babies. My brother is a low functioning downsie. He used to love to hold babies but it’s rare someone let’s [sic] him now. According to Kevin, this was Daniel’s first meeting with Maysen Ava, as he’d just returned to California from a New Guinea trip with his parents. The post has been shared over 133,000 times, (at the time of writing), with many people commenting to offer thanks to Kevin for raising awareness. I have a sister with downs and her mental capacity has declined so much of as late. This brings tears to my eyes because I know the beautiful heart she has and how she used to express it. I miss the love she used to show so much. Lately she barely acknowledges me. Thank you for making that loving gesture to your brother. His reaction is priceless. Thank you for reminding me love is something we all share and we all need; it’s not complication and suffering and labor and hardship and duty; it’s simple and pure and joyful and fragile and the most important thing in life. I need to love more like your brother does. I think we all do. I hope people learn individuals with DS give the purest type of love, all the kid wanted was to hold and be held. A really simple thing. When he was younger I think it was easier for people to show him affection, but now he’s older, he’s a child trapped in a man’s body and I think this changed people’s perception. I don’t know anyone that shows joy the way my brother does and the world is a little less bright with a little less joy when we lose people with DS or parents decide not to have them. Hopefully, Daniel’s story will help people to think twice before judging the abilities of a person with Down’s Syndrome.